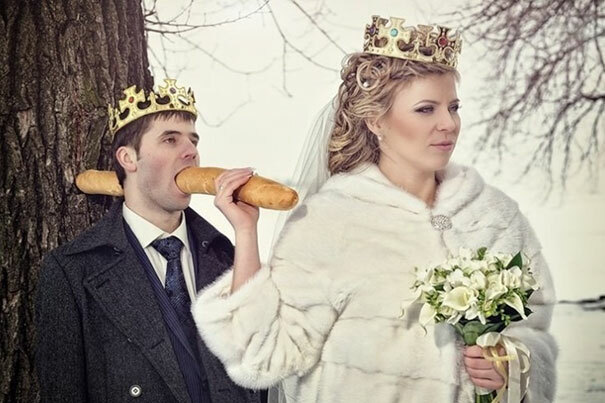 I think it’s fair to say that in Russia, they do the traditional wedding photos rather differently. While in the Western world it’s all about romance, beauty and gazing longingly into each others eyes, Russian couples choose to let their humor and personalities shine through. And as you will see, they sometimes come up with bizarrely creative and hilarious examples that will never be forgotten! From some questionably tacky efforts, to some that are obviously poking fun at themselves, these guys clearly love using photoshop almost as much as they love each other. To celebrate this, we have compiled a list of our favorites for you to enjoy and take inspiration from, if you want your wedding photos to be a little different from the boring standard formula that we tend to stick to. Get On The Train Of Fun. Also, Is The Bride A Centaur?